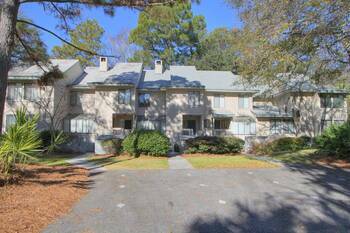 2 bedroom 2 bath completely renovated Beachwalk condo! Pet Friendly luxury condo. 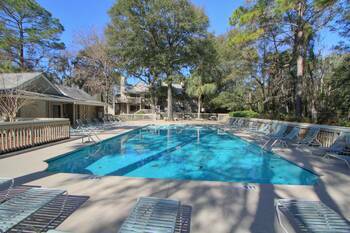 This condo is nicely furnished including stainless steel appliances and granite countertops! The master bedroom has a king bed, chair which folds our into single and a private bathroom. The guest bedroom has a queen bed and a twin bed with the bathroom located in the hall. The living room has a sleeper sofa as well. Updated luxury Flat at Beachwalk for you to enjoy. Pet Friendly complex is rare and the first floor flat is hard to find. Huge kitchen in the flat with updated stainless steel appliances, new hardwood floors too. Fully furnished and the kitchen is stocked too with all the essentials to prepare meals. Huge outdoor patio to relax after a day at the beach or pool. ONLY a Five minute walk to the ocean on a shaded path. Truly a pleasure to stay in this 2 BR flat at Beachwalk condos in Shipyard. 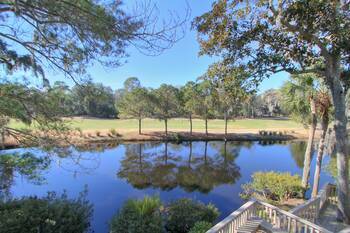 Shipyard offers bike paths, golf course and gated secured community all minutes to everything on Hilton Head Island. Updated kitchen that now opens out to living room, dining area and the huge patio. Washer and Dryer are in the condo. Community pool is included and Van Der Meer Tennis is right across the street. 27 holes of golf in Shipyard too. 30 golf courses within 20 minutes. 250 Shops, 250 Restaurants, 400 tennis courts, 117 miles of bike paths and 17 miles of beautiful beaches. What a wonderful family vacation spot. You will come back every year! !